International Anti-Corruption Day (IACD) has been observed annually on 9th December to raise public awareness of corruption and what people can do to fight it. The 2017 joint international campaign focuses on corruption as one of the biggest impediments to achieving the Sustainable Development Goals (SDGs). 2017 Theme: United against corruption for development, peace, and security. Every year USD 1 trillion is paid in bribes while an estimated USD 2.6 trillion are stolen annually through corruption. 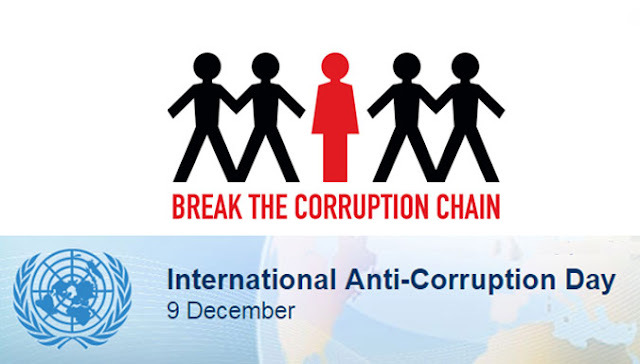 Note: The UN General Assembly (UNGA) had designated 9th December as International Anti-Corruption Day by passing resolution 58/4 of October 31, 2003. Eminent Hindi litterateur & playwright Mamta Kalia has been selected for ‘Vyas Samman-2017’ for her novel ‘Dukkham Sukkham’. The novel 'Dukkham Sukkham' depicts the story of grandmother Vidhyawati and granddaughter Manisha's relation. The book, 'Dukkham Sukkham' was published in 2010. Currently, she is the editor of Mahatma Gandhi International Hindi University's quarterly magazine ‘Hindi’. Mamta was born on November 2, 1940 in Vrindavan. Vyas Samman was instituted in 1991 by the KK Birla Foundation and carries a cash award of Rs 3.50 lakh, a citation, and a logo. It is awarded annually in recognition of the Hindi literary work published in past 10 years in genres like novels, play, short stories, poetry, critiques, and others. Kacheguda railway station (South Central Railway) has earned the unique distinction of being the First Energy Efficient ‘A1 Category’ Railway Station on Indian Railways. The station has achieved 100% energy efficiency replacing 1,312 conventional lights with light-emitting diode (LED) lighting. Around 370 ceiling fans too were replaced with Brushless DC Electrical (BLDC) motors energy efficient fans and 12 air conditioners with energy efficient inverter type air conditioners. All these measures will save about 1.76 lakh units and Rs. 14.08 lakh per annum with reduction of the connected load by 46.18 kW for Railways. The Union Housing and Urban Affairs Ministry has signed an agreement with German firm GIZ for technical cooperation in the implementation of transport projects in Coimbatore, Bhubaneshwar, and Kochi. The agreement has been signed by the ministry's officer on special duty Mukund Kumar Sinha, and GIZ Country Director Wolfgang Hanning in the presence of Housing and Urban Affairs Minister Hardeep Singh Puri. Around 29 crore rupees through GIZ is envisaged for this purpose over a period of three years. Note: The main objective of the agreement is to improve planning and implementation of sustainable urban transport. Domestic private jet operators will no longer need clearance from the aviation regulator for overseas flights. The revised norms, applicable at airports with custom and immigration facilities, will come into effect from 15th of this month. This move is being seen as a step to boost ease-of-doing business. Presently, prior permission of the Directorate General of Civil Aviation is mandatory for Indian-registered charters or private jets to fly out of India. According to the Health Minister J P Nadda, India has been declared free from infective Trachoma which is a contagious bacterial infection of the eye. The Survey results indicate that active Trachoma is no longer a public health problem in the country. It causes inflamed granulation on the inner surface of the lids. Releasing the National Trachoma Survey Report (2014-17). This has been possible due to efforts that included the provision of antibiotic eye drops, personal hygiene, availability of safe water, improved environmental sanitation and availability of surgical facilities for chronic Trachoma. India's foreign exchange reserves increased by 1.2 billion US Dollar to touch a record high of 401.942 billion US Dollar in the week (on 1st December 2017). Foreign currency assets rose by 1.151 billion to 377.456 billion US Dollar. In the previous week, the reserves had surged by 1.208 billion US Dollar to cross the 400 mark, and touched a peak of 400.741 billion US Dollar. India's reserve position also increased by 7.4 million to 2.280 billion US Dollar. The union govt. has fixed the issue price of Sovereign Gold Bond (SGB) at Rs. 2,890 per gram for the next subscription period under Sovereign Gold Bond Scheme 2017-18. The next subscription period is 11th to 13th of this month. The government had floated Series-3 of Sovereign Gold Bonds 2017-18 (from 9th of October to 27th of December 2017). The government in consultation with the RBI has decided to allow a discount of Rs. 50 per gram from the issue price to those investors who apply online and the payment is made in digital mode. Uttar Pradesh will host the eighth Hockey India Senior National 'A' Division Championship from 15 to 26, March 2018. All matches will be played at the Mohammad Shahid AstroTurf stadium in Gomti Nagar, Lucknow. Around 20 teams from across the country will participate in the elite hockey tournament with reigning champions Railways defending their title with the help of several international players. Earlier, Uttar Pradesh had hosted the sixth championship in Etawah in 2016, while the seventh was held in Bhopal this year. India won five medals at the 10th Asian Airgun Shooting Championships in Japan. Ravi Kumar won an individual bronze in the men's 10-metre air rifle, while Arjun Babuta won individual silver in the corresponding junior men's event. India also bagged three team silver medals in each of the three air rifle events. Olympic bronze-medallist Gagan Narang missed out on an individual podium finish. This will be the same range where the shooting competitions for the Tokyo 2020 Olympics will be hosted. India lost to Argentina (Rio Olympic Champions) by a solitary goal in the first semi-final of the ongoing Hockey World League Final at Bhubaneswar, Odisha. Today, the second semi-final between Germany and world champions Australia will be played. on Sunday, India will now play against the losers of the second semi-final for the Bronze medal.